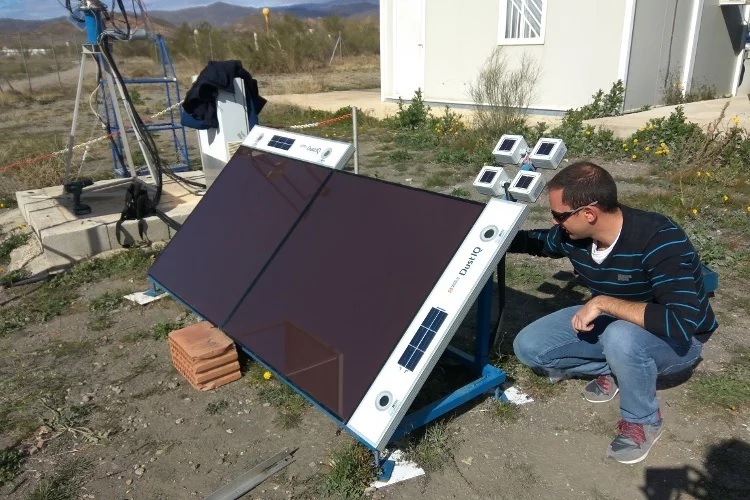 Published: Thursday, March 1, 2018 I’ve just returned from Spain where I installed a new test setup for DustIQ at Plataforma Solar de Almeria (PSA). This solar research site is located in the Tabernas Desert, 30 km from Almeria and is a perfect location to challenge our DustIQ to a dusty environment. This desert is also the stage for some well-known films; scenes of the westerns of Sergio Leone (the Good, the Bad and the Ugly), Indiana Jones and Conan the Barbarian were recorded here. This harsh environment provides a good test location for the DustIQ. The site receives a direct annual insolation of over 2100 kWh/m2 and the average annual temperature is around 17°C. PSA is the largest research, development and test centre in Europe dedicated to concentrated solar energy and belongs to CIEMAT (the Spanish Centre of Energy, Environmental and Technology Research). At PSA, CIEMAT and DLR (German Aerospace Center) work closely together to evaluate solar power technologies. The PSA research centre is fully equipped with a unique network with over 10 automatic solar trackers with pyrheliometers and over 50 pyranometers distributed within approximately 1 km² and you will find many Kipp & Zonen instruments around their facilities. When I arrived at the site, I was welcomed by Dr. Stefan Wilbert from DLR and Sergio Gonzales from CIEMAT. They work on radiation measurements, nowcasting, data resources, soiling, and other topics. They were excited to have a DustIQ at PSA because, although it is initially designed for photovoltaic solar energy plants, it also offers potential for concentrated solar thermal power applications. Soiling also has a significant impact on the performance of mirrors, reflectors and absorber tubes of heliostats and troughs. With 2 pyrheliometers on a Kipp & Zonen 2AP sun tracker, where one looks directly at the sun, and the other looks at it through a mirror. The build- up of soiling on the mirror is determined in this way. Read more about this so-called TraCS system here. With a setup to measure soiling of envelope tubes of parabolic trough absorbers. When I arrived in the morning, the friendly technical staff, Sergio Gonzales and David Muuve, helped me to install the two DustIQs on an existing frame with 2 thin film PV panels that are also used for soiling measurements. One DustIQ was mounted vertically on the side and the other one horizontally on top of the frame. The output of both DustIQs will be compared to the other soiling measurements on site. Additionally, we have installed a CMP3 to measure the POA (plane of array) irradiance of this specific set up. The installation went smoothly and by the end of the day we were collecting measurements through a Campbell Scientific CR1000X data logger. Every 10 minutes data is sent directly to the Kipp & Zonen FTP server at our headquarters in the Netherlands. We will work together on the soiling data, and publish a paper about the performance. Subscribe to our DustIQ news feed to receive news and the test results in your mailbox. As standard, a DustIQ will be delivered calibrated for Arizona Test Dust. However, local dust may have a different colour and thus different scattering properties, which determines the signal strength as measured by the DustIQ. For the best performance of the DustIQ users should perform a field calibration, a simple procedure that takes 5 minutes and enables the DustIQ to determine the scattering properties of the soiling. I’ve collected local dust samples from the site and brought them back to Delft, where we will characterize the dust. We want to compare the scattering properties obtained by these two DustiQ’s using their local-dust-calibration procedure with the values we can obtain in the lab. At R&D we are looking forward to further cooperation with DLR and PSA. More soiling studies are being planned, such as a ‘desert test’ where we will perform a comparison of pyranometers with and without ventilation, test the AirShield® DNI for pyrheliometers and the instruments of the RaZON+ for their resistance to soiling. A big thank you to everybody at PSA, DLR and CIEMAT for your help and enthusiasm!